I can't believe what I stumbled upon tonight on Amazon! 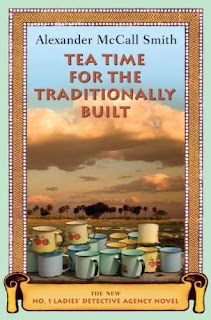 Tea Time for the Traditionally Built (No. 1 Ladies' Detective Agency, Book 10) by Alexander McCall Smith will be released on April 21, 2009. I didn't know there was another book in the works. This is great news for fans of this series, such as myself. It's time to pour a cup of tea and celebrate! But there's more terrific news! The two-hour pilot of The No. 1 Ladies' Detective Agency series, directed by Anthony Minghella, will premier in the United States on HBO on March 29, 2009, and six additional weekly episodes will follow on Sunday nights. This series stars actress and singer Jill Scott as Mma Precious Ramotswe, Anika Noni Rose as Mma Grace Makutsi, Mma Ramotswe’s quirky secretary, and Lucien Msamati as Mr J.L.B. Matikone, Mma Ramotswe's love interest. It's the first movie series filmed in Botswana, and I'm really looking forward to watching it. I have only read one of those detective books. Now you have me interested in reading more! I always like it when books I like are made into movies! You will enjoy each and every one that you read! I read the entire series (with the exception of the book-to-be, which I'll definitely read). Allie, thanks for your comment! April 21, 2009 can not come soon enough! This traditionally built lady can't wait to read the latest in this series. They're a fave of mine! Thanks for the heads-up. I don't get HBO so I'll have to wait until the filmed version comes to DVD. Will you let me know? You're my go-to source for all things No. 1 Ladies Detective Agency related. Thanks so much! P.S. I've heard you mention that you sell books through Amazon. Is there a way to pre-order this book through your Amazon book store? I'd like to support a great friend! Let me know. Christie, I won't be selling this particular book but thanks so much for asking. As far as HBO goes, we don't have it yet either, but I hope we can work out "a deal" with our cable company. I am definitely watching this series!